Throwback Sports makes bags that are designed for fun. If you love taking all your gear plus keeping your drinks cold for hours, then this might be the bag for you. Back To The Drawing Board As a young, small business we take your feedback and suggestions seriously. So we worked with a Dutch designer to build the Throwback Pack 2.0 from the ground up. 4 outer pockets making accessing putters and your other go-to discs a breeze. The main compartment comes with 2 dividers which can be removed or reconfigured anyway you want. You can easily carry 20 discs, and stretch it to 25. Keeps Drinks Cold Each of the 2 large side pockets are double insulated and lined like a soft cooler so you can throw a reusable ice pack and a few cans in each pocket and have cold drinks while you play - completely separated from your discs. Other Things You'll Love - Double D-rings on top let you hook towels or whatever else you need - Double cup holders that can accommodate up to a 32 oz water bottle in each. 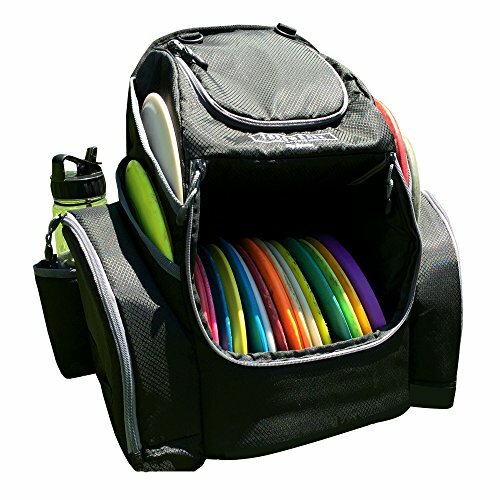 - Wide plastic feet with a tarpaulin bottom that wipes clean from dirt and mud - Larger top pocket to hold your wallet, keys, phone, and a few other small items - Comfortable straps and back with a quick grip handle on top, for when you're just taking a short walk to the next tee. - Improved zipper pulls and ripstop fabric make the bag more stylish and durable than ever.